Having made a giant batch of applesauce this fall (unpeeled apples, a pinch of salt, lemon juice and nothing else), I realized last week that what was left would probably ferment if I didn't do something with it, and quick. So, I decided to whip up one of my favorite desserts, a spiced applesauce cake. Previously, I've made a fresh ginger glaze for it that tastes delicious but sort of curdles and doesn't look all that pretty. 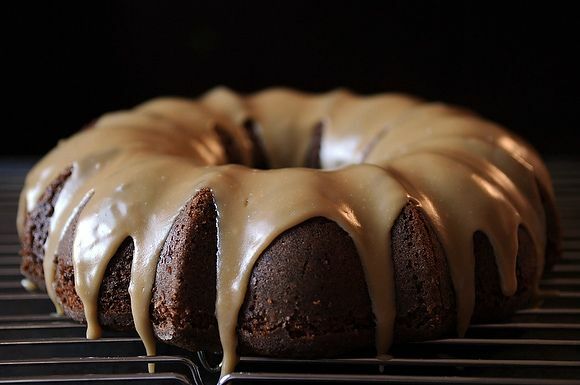 This time, I found inspiration in a rich, sweet, Southern-stye caramel icing from Craig Claiborne's New York Times Cookbook, which I've made a few times for other cakes. But I wanted a true glaze, not an icing, so off to the interwebs I went. Imagine my delight when I came across the perfect recipe on the blog of our very own TheRunawaySpoon! I adapted the measurements slightly, as I found I needed a little less powdered sugar to keep my glaze runny enough to drizzle, and it turned out to be the perfect complement to this tender, spiced and just slightly sweet cake. Thank you, TheRunawaySpoon, for your help, and I hope you all enjoy this cake and have a very happy New Year! 1. Heat the oven to 350 degrees and butter and flour a 12-cup Bundt pan. Sift together the flour, baking soda, salt, pepper and spices and set aside. In a large mixing bowl or the bowl of a standing mixer, beat the eggs with both sugars until light. Mix in the applesauce, oil and vanilla until smooth. 2. Using a spatula, fold in the dry ingredients, being careful not to over-mix. Pour the batter into the prepared pan and bake for about 45 minutes, until a cake tester inserted in the center of the cake comes out clean. Cool the cake for 10 minutes in the pan on a rack before turning it out and cooling completely on the rack -- make sure the cake is not at all warm before you make the glaze. 3. TheRunawaySpoon wisely advises that you put a piece of foil or paper under the cooling rack to catch any drips before you start the glaze. Put the butter in a medium saucepan with the brown sugar, cream and salt and set over medium heat. Bring to a full rolling boil, stirring constantly. Boil for one minute exactly, and then pull it off the heat. 4. Leave the pan to cool for a couple of minutes, and then gradually whisk in the powdered sugar until you have a thick, but pourable consistency (you may not need all the sugar). If the mixture seems too thick, just add a splash of cream to thin it out a little. Immediately pour the glaze over the cake, moving slowly and evenly to cover as much surface area as possible. Let the glaze set before serving the cake. Note: If you're serving this cake to demanding or hyper-observant guests (What? Did I say that? ), you may want to glaze the cake right on the plate you plan to use to serve it, forgoing the rack. As soon the glaze has even the slightest chance to set, it will crack if you try to transfer the cake from rack to serving plate. This is simply one of the best cakes I've ever made. I've been asked to make it over and over again. Hi - plan on making this for a very (very) long road trip. Quick question. Only have olive, coconut, and avocado oil in the house. Would one of these work for the vegetable oil? thanks! I am interested in hearing about the applesauce made from unpeeled apples. I usually do applesauce in the slow cooker - and then just mash it with a potato masher. But, peeling apples is time consuming and sticky. How does it work to make applesauce with unpeeled apples? I made this cake last night and added the glaze this morning- perfect. Also, it takes very well to the addition of a 1/2 teaspoon of crushed/ground grains of paradise. I make this all the time! Yesterday I somehow forgot to pick up heavy cream at the store, so I improvised a glaze of bourbon, sugar, and lemon juice. While I still love the caramel glaze, I also really liked the "adult" flavor the bourbon gave this cake. That sounds delicious! Can you share the proportions? Would love to try it. Love this cake! Really moist and delicious. Can't wait to bake it again and follow fiveandspice's suggestion and add apple pieces. Delicious cake! My presentation wasn't as beautiful as yours though... I wasn't very generous with the glaze when I started drizzling it. I made the mistake of trying to add another layer of glaze, but it had already set, leaving gloops of glaze on the top of the cake. (Clearly, I'm a novice with glazing!) Even though it didn't look pretty, the cake was moist and the glaze was sweet, but not too sweet. Thank you! Hey! Just notcied the mention - thanks so much for trying out my caramel glaze. It sounds so delicious on this apple cake, I'll have to try it soon! I just love the color of this cake and am thinking about making it right now! And I want to wish you a Happy New Year! This was fantastic and that glaze? Divine! I thought the cake tasted better with time. We ate most of it for brunch yesterday then had a couple of pieces left for breakfast today. Even more delicious! I have loads of applesauce too and was wondering what to do with that. Now, I know. It was delicious! Thanks for a great recipe. gorgeous cake! can't wait to make it! Happy New Year! Happy New Year to you too! Hope you like it. I made this cake last night for an impromptu dinner and it was so good! My husband is having a piece for breakfast at this very moment. The caramel glaze is really fine . Thank you. I'm so glad. And you're very welcome! This looks like the most wonderfully creative interpretation of a candied apple into a cake! I hadn't thought of it that way -- I like it! This looks absolutely wonderful. I love most anything with apples in it, and I love caramel - so this is the perfect recipe for me. I can't wait to try it!! This came out of the oven this morning and we're glazing in about an hour - it smells super-delicious. Thanks, Merrill! Holy cow, the glaze is delicious - the cake cools it off as you pour, so the advice to go slowly is good; you can just barely see that I took a second trip around to fill in some spots. Merrill, I have a question...in the interest of time and my hectic schedule this week...can I make the cake on Thursday evening and then make the glaze and glaze it Friday evening right before I leave for the party? Or should I try to do it all Friday? It looks lovely! You can definitely make this cake on Thursday night and glaze it on Friday. It will probably be even better that way. You can totally make the cake ahead. It stays nice and moist for a couple of days -- just store it in an airtight container once it's cooled. Hope you like it!